CBD and PTSD - How Does CBD Help So Many PTSD Patients? Thank you for joining me for a deeper look into the inseparable relationship between CBD (cannabidiol) and PTSD (Post Traumatic Stress Disorder). Following is a collection of the main topics and questions surrounding this disorder and relief. It is my hope that you will better appreciate how this serious health problem should be addressed on a national level by leveraging the healing power of CBD for these patients who are suffering. Ironically, this can be accomplished at a significantly lower cost to the patient with virtually no patient risk. It is a non-psychoactive and completely non-addictive treatment alternative as well. Are you listening Mr. David Shulkin? Who was duly fired on March 28, 2018 by President Trump from Head of the Department of Veterans Affairs. And how about you Dr. Tom Price, who at the first post of this article was the new Head of Health and Human Services Department? Well, he just resigned in the face of the evidence that he had been enjoying jet-setting on our hard earned tax dollars. Contrary to the current news media headlines, it’s still business as usual, except the freaking head of the Senate, Mitch McConnell (R-KY) just announced mid-April ’18 that he’s backing the expansion of The Farm Bill to include guess which State? You guessed it. And if that ain’t swampy enough, Dr. Ronnie Jackson, the personal physician for both Obama and Trump has just resigned 14 hours ago rather than bother with the onslaught of completely irrational political noise. I would too. Congratulations! How does CBD Help PTSD? Post Traumatic Stress Disorder is a psychiatric condition that often develops in people who have experienced or otherwise witnesses a traumatic event. PTSD is often described as being a combination of physical and emotional symptoms that manifest as a result of war combat, sexual assault, serious injury or even natural disasters. Terms like “shell shock” and “combat fatigue” were used in generations past to describe the symptoms these soldiers experienced and often endured for the rest of their lives. They effectively re-live the trauma (the traumatic event) long after the danger or physical pain is gone. Patients complain of nightmares and flashbacks. Sensitivity to the most innocuous and ordinary life experiences is also a characteristic behavior. And according to what I have come to understand, the patient can even suffer from the perceived effects of an event on another person, effectively a victim of severe empathy or sympathy. Occurring most often in women, PTSD affects about 3 to 4percent of adults the U.S., and it has been estimated that about 9% of people will develop it at some point in their life. The term “post traumatic stress disorder” was coined during and after the tragedy known as The Vietnam War and officially recognized in 1980 by the American Psychiatric Association. Feelings of guilt or responsibility, loss of trust and joyfulness. According to Wounded Warriors Homes.org, over 540,000 current veterans have been diagnosed with Post Traumatic Stress Syndrome. One in five came home from the Iraq War with PTSD. Instead of a national movement to help health these patients with well-known and natural cannabidiol and Cannabis products, approximately 20 veterans commit suicide every day because the U.S. Medical Industrial Complex and the U.S. Federal Government’s Justice Department will not approve nor provide them cannabidiol. Meanwhile, PTSD is treated more like a ‘political inconvenience‘ in the United States. The news media is filled with articles and posts railing against Veteran’s Administration doctors and American physicians in general about medical care in America. They are being accused of malpractice for prescribing deadly amounts of opiate narcotics and synthetic opioids apparently to quiet the patients while ignoring the less addictive and psychoactive treatments for PTSD… and just about any kind of chronic physical pain as well. A general understanding our body’s endocannabinoid system, aka endogenous cannabinoid system (eCB system), is requisite to understanding how CBD works. For a more detailed post of mine on “Cannabis and The Endocannabinoid System”, please click here. It’s one of the most important systems of the human body and interacts with virtually all of the others. Generally speaking, natural cannabidiol (CBD hemp oil) is recognized as a powerful neuromodulator which does just what it sounds like. Cannabidiol “regulates” the central nervous system (brain and spinal cord) via a network of nerve receptor cells and are widely distributed throughout our bodies. Among other things, it has been discovered that cannabinoid type 1 receptors (CB1) play an integral role in controlling fear impulses and behavior while impaired CB1 function has been determined to cause anxiety and depression-like symptoms in lab animals. The Multidisciplinary Association for Psychedelic Studies (MAPS) and others have studied Cannabis and it’s cannabinoids. Their researchers have found that people who have been diagnosed with PTSD have lower levels of anandamide (“The Bliss Molecule“). Anandamide is an endogenous (meaning: growing or originating within our bodies) cannabinoid compound innate to all mammals. Anandamide has been described by scientists as our “inner cannabis” because it triggers the same nerve receptors as those activated by CBD and THC, the two most prevalent of the 85+ cannabinoids found in the Cannabis plant. So, one of the basic characteristics of PTSD is a measurable endocannabinoid deficiency in these patients. Cannabis plays a vital and natural replenishment function for essential, organic chemical stimulation naturally balancing a patient’s entire nervous system. For more and more patients suffering from PTSD, organic Cannabis compounds provide relief from its debilitating symptoms. And despite the obfuscation and deliberate lies about Cannabis by our own Federal government. In spite of all the research around the world for decades, government funded websites and other publications deny any such beneficial relationship from anything whatsoever that is derived from Cannabis plants. 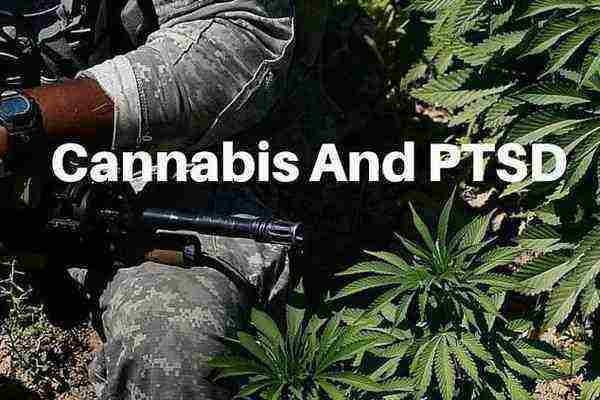 Following are some CBD benefits that PTSD patients can expect in varying degrees. This allows prescription medication, addictive drugs or alcohol to be minimized and subsequently the adverse side effects from many of these prescription medications can be mitigated. On Hello MD, Dr. Andrew Vanderveer confirms that Cannabis compounds like CBD and THC help bring our endocannabinoid system back in equilibrium. Although he wouldn’t comment on specific products, he advises starting with a small dose and observe results by increasing the dosage until desired results are achieved. Dr. Vanderveer affirms that “there is no danger in taking very high doses of cannabis products. However, as with any other plant derived extracts and concentrated products, quality and purity can vary significantly. Although it is not hard to find thousands of physicians and research scientists who have published their determinations regarding their research and patient experiences regarding the medical benefits of cannabidiol, the Veteran’s Administration has conducted no studies whatsoever. Hmmm… and do any of you remember when the V.A. was publishing their “statistics” on “marijuana abuse” in the military? I do. And it was as ridiculous then as it is today. Only after a thorough and willful re-evaluation of past & present, personal experience(s) can an honest clinical review process proceed. Well-defined and structured support systems are formed and the final phase of recovery be approached. The patient’s gains are clearly recognized and more fine-tuned when group sessions are, in time, introduced to reinforce confidence, acknowledgement of personal skills, values, and create the patient’s own evergreen care plan with family and even totally new friends. Common types of counseling for PTSD include Cognitive Behavioral Therapy (CBT) and Prolonged Exposure Therapy (PET). Unfortunately, prescription medications are doled out like candy by physicians in the face of their unhealthy and unwanted side effects, interactions with alcohol and other medications, pregnancy health, and so many more mental and physical health concerns. For those of you who are seeking the most current background information on the most effective, 100% bioavailable, CBD nanoscience… please consider my article on“CBD and Nanotechnology“. You’ll know more about the most current solutions, and why. Commonly prescribed prescription medications consist mostly of “Selective Serotonin Reuptake Inhibitors” (SSRI’s) and “Serotonin-norepinephrine Reuptake Inhibitors” (SNRI’s) and are published as being effective in the treatment of posttraumatic stress syndrome. Now go ask a serious PTSD patient if they work. Then ask them what their side effects are. And if you are not totally disgusted by what you are hearing, ask if they are looking for something that is 100% natural, 100% safe, and 100% non-addictive... and that’s why PTSD patients are incorporating cannabidiol to their regimen while weaning off their most destructive prescriptions first – with the goal of getting off all of these meds permanently. I’ve never met anyone who didn’t wish they could get off these kinds of medications. Recognize any of these little beauties? *Dronabinolis the generic term for THC (chemical term abbreviation) and has been prescribed since 2004. And you thought weed was against Federal law. Clearly the law doesn’t apply when you ARE the Fed and can control the manufacture and supply of THC in pill form. Yes, this enduring misinformation and prohibition on the Cannabis plant species is essentially about control. Since we are all finding out that prescription meds don’t do the trick and come with numerous, undesirable side effects, CBD has become even more scrutinized and examined by physicians who are using it to treat their own issues. Increasing numbers of health professionals are becoming more outspoken regarding their own experiences with CBD to treat their own problems as well as their family and patients. They realize that it’s the THC (tetrahydrocannabinol) in weed that can induce anxiety in some people, but the same chemical evaluations show it actually counteracts the psychoactive effects of THC. It’s theCBDthat provides the calming effect for everyone including hyperactive children and our pets. The sooner people realize the many benefits of CBD, the sooner we can lower the cost of healthcare – dramatically! For a deeper look at CBD, take a look at my post “What is CBD Hemp Oil?”… and “What is CBD Oil used for?”. So meanwhile, we resolve to battle the problem at the State level so that we can continue to self-medicate if necessary with higher amounts of CBD and THC. As you probably know, these are the two main, highly active and powerfully healing cannabinoids found in the various Cannabis species. Toxicology studies have all shown that even relatively high doses of CBD (1500mg per dose) has no effect on blood pressure, body temperature, or any other vital sign that is measured. So there we have it, a current look at how CBD and PTSD is becoming mutually beneficial terms instead of unknown ones. I’m encouraged that more and more PTSD patients are choosing CBD as a way to at least take the edge off their pain, depression and anxiety while steadily reducing the amount of prescription meds that they have been prescribed. It’s obvious to all of us who use cannabidiol that CBD improves our quality of life as well as helping to heal our nervous system naturally instead of dealing with unwanted side effects of the aforementioned SSRI’s and SNRI’s. Please let us hear from you… Don’t go without leaving a comment below! Pingback: Where Can I Buy CBD Oil? | Is CBD Legal?